Left ventricular assist devices (LVADs) extend survival of patients with end-stage heart failure as a bridge to transplant or for destination therapy. However, implant of these devices may be challenging, especially in cases of a left ventricular aneurysm involving the left ventricular apical wall. 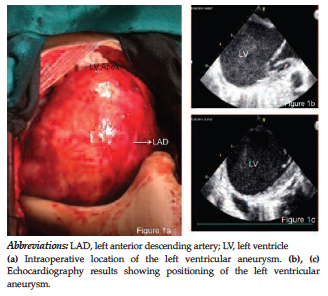 In this report, we describe a symptomatic patient with ischemic cardiomyopathy and a large left ventricular anterior aneurysm treated by reco­nstruction of the left ventricle and simultaneous implant of the HeartWare LVAD system (HVAD; HeartWare International, Inc., Framingham, MA, USA). A 62-year-old male patient was referred to our center 26 days after acute myocardial infarction with ischemic cardiomyopathy and New York Heart Association functional class IV heart failure. Echocardiography revealed left ventricular ejection fraction of 12% and a large left ventricular aneurysm (4.0 × 3.5 × 3.0 cm). Left ventricular apical wall thickness was 4.0 mm on echocardiography. Cardiac catheterization was performed; pulmonary vascular resistance was 6 mm Hg·min-1·L-1, and trans­pulmonary pressure gradient was 18 mm Hg. Therefore, the patient was not a candidate for heart transplant. Left ventricular assist device implantation with surgical ventricular reconstruction was decided due to the patient’s deteriorating clinical situation, despite maximal medical therapy. After median sternotomy, cardiopulmonary bypass was established via aortocaval cannulation. A large aneurysm involving the anterior and lateral wall of the heart was encountered (Figure 1). Aneurysm resection with linear reconstruction was performed by a longitudinal incision parallel to the left anterior descending artery with subendocardial thrombectomy, without cross-clamp and cardioplegia, on the beating heart. Resection was extended to the anterior and lateral left ventricular wall, leaving behind approximately 4 cm of apical wall to implant the pump. The HVAD system was implanted using a standard technique as described in the instructions for use (Figure 2). 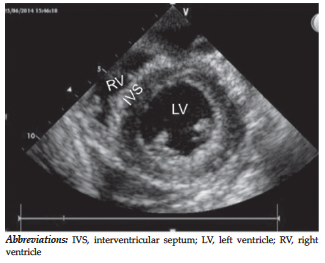 Intraoperative epicardial echocardiography revealed geometrical symmetry with reduction of the left ventricle cavity (Figure 3). The HVAD was fully functional postoperatively. The patient was extubated on postoperative day 1. The patient’s postoperative period was uneventful, and he was discharged home on postoperative day 12 with a therapeutic international normalized ratio level. In our patient, a decision was made to implant the HVAD system with simultaneous ventricular reconstruction. Thrombectomy without ventricular reconstruction could result in a potential endocardial surface amenable to newly generated thrombus with a resultant increased risk of a cerebrovascular event or pump thrombosis. Furthermore, it would be a challenging surgical procedure to implant the device in the considerably thinned ventricular wall. Therefore, we decided on reconstruction of the ventricular wall followed by implantation of the HVAD. There are 3 previous reports of ventricular reconstruction along with continuous flow LVAD implantation. Garbade and associates reported a simultaneous Dor procedure with LVAD insertion (Thoratec HeartMate II; Thoratec Corporation, Pleasanton, CA, USA).3 They implanted the device on the synthetic patch of the reconstruction site. Although this seems a reasonable method, there are some drawbacks regarding the stability and hemostatic fixation site of the device on synthetic patch material. On the other hand, this technique may provide a more consistent reconstructed ventricular geometry for long-term support. Chernyavskiy and associates also described insertion of an LVAD (Berlin Heart INCOR; Berlin Heart Inc., The Woodlands, TX, USA) in which they secured the inflow cannula onto the synthetic patch material.4 More recently, Fatullayev and associates described a method without the use of synthetic material, partially reconstructing the ventricular wall followed by LVAD implantation (HeartWare device) onto the remaining part of the apical wall.5 We believe this may provide a more stable and hemostatic surgical option. In recent years, although total artificial heart implantation is usually recommended in patients with cardiomyopathy and left ventricular aneurysm due to the thinning of the apical wall and difficulty of LVAD insertion, which includes a high risk of surgical mortality, we believe that implantation of latest generation LVAD is a viable alternative due to ease of implantation and lack of postimplant resistance in left ventricle contractility. Our experience shows that left ventricular aneurysm resection may be compatible with the simultaneous insertion of the HVAD system. Rose EA, Gelijns AC, Moskowitz AJ, et al. Long-term use of a left ventricular assist device for end-stage heart failure. N Engl J Med. 2001;345(20):1435-1443. Sabashnikov A, Mohite PN, Weymann A, et al. Outcomes after implantation of 139 full-support continuous-flow left ventricular assist devices as a bridge to transplantation. Eur J Cardiothorac Surg. 2014;46(5):e59-66. Garbade J, Bittner HB, Barten MJ, et al. Combined surgical left ventricular reconstruction and left ventricular assist device implantation for destination therapy in end-stage heart failure. Circ Heart Fail. 2011;4(4):e14-15. Chernyavskiy AM, Marchenko AV, Lomivorotov VV, Doronin D, Alsov SA, Nesmachnyy A. 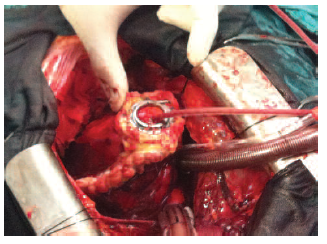 Left ventricular assist device implantation combined with surgical ventricular reconstruction. Tex Heart Inst J. 2012; 39(5): 627-629. Fatullayev J, Butters T, Sabashnikov A, et al. Left ventricular assist device implantation with concomitant left ventricular reconstruction without patchplasty. J Artif Organs. 2014;17(4):370-372. Acknowledgements: The authors declare no conflicts of interest with respect to the authorship and/or publication of this article, and they received no financial support for the research and/or authorship of this article. This work was presented at the 22nd Annual Congress International Society for Rotary Blood Pumps (ISRBP), San Francisco, CA, USA, September 25-27, 2014.